Though sometimes confusing, beading wire is not the same thing as jewelry wire. Jewelry wire is just a single strand of wire often made of brass or copper. Jewelry wire is most often used for sculpting and wire wrapping. Beading Wire, like Tigertail, is made up of multistrands of very fine steel cables and usually twisted together. These multistrands are then coated with plastic or nylon, which can come in a variety of colours. The coating creates a tough and resilient beading wire. 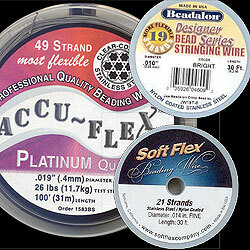 Among the more well known brands of beading wire are from Beadalon, Soft Flex, and Accu Flex. Often to differentiate between beading wire and metal/jewelry wire, the former is often referred to by their brand or trade name rather than in its generic term.